Sunday is it. The big day will be here as the Denver Broncos take on the Carolina Panthers. Peyton Manning squares off against the up and coming Cam Newton in a showdown for the coveted Lombardi Trophy, first hoisted into the air by the Green Bay Packers back in 1967, three years before the legendary namesake passed away. Fast-forward 40-plus years and we've arrived at that day again, though this time the game will be held in a more temperate climate, as that is now the way the league wants it to be. No more frozen tundra, but weather more suitable to fans and media. This season TuneIn Radio made broadcasts of games available for the first time. It required a subscription, but it was much cheaper than NFL Sunday Ticket. Now it's adding its own NFL news with a program called No Huddle. The show was unveiled this week as part of the big Super Bowl celebration, which includes a show at the Moscone Center. 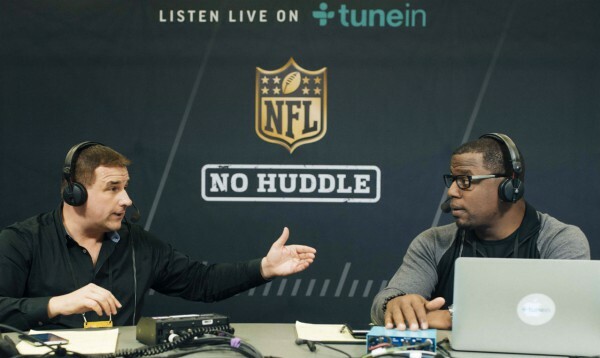 "The show is available to all TuneIn users via NFL on TuneIn, a 24/7 NFL channel that also features audio from select NFL Media programming, including popular NFL Network shows such as NFL Total Access, Around the NFL, and NFL HQ", the service announces. The show can be heard Monday through Friday 4pm-7pm on TuneIn's dedicated NFL channel.